During two days, 35 experts from 14 countries have been able to share their knowledge and their experiences. Research Institute for Innovation & Technology in Education (UNIR iTED) didn’t want this to be just a Congress but a Workshop, where all the contributions have became into this Open Educational Resource that contains all the pictures, interviews, analysis, thoughts and impressions of this days. We sincerely hope that you like and share it, so the community can see the importance of what we are trying to get: better education, better learning. To see all the pictures and interviews visit our Flick album and the video links. 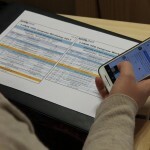 Don’t miss anything, go to the Storify! 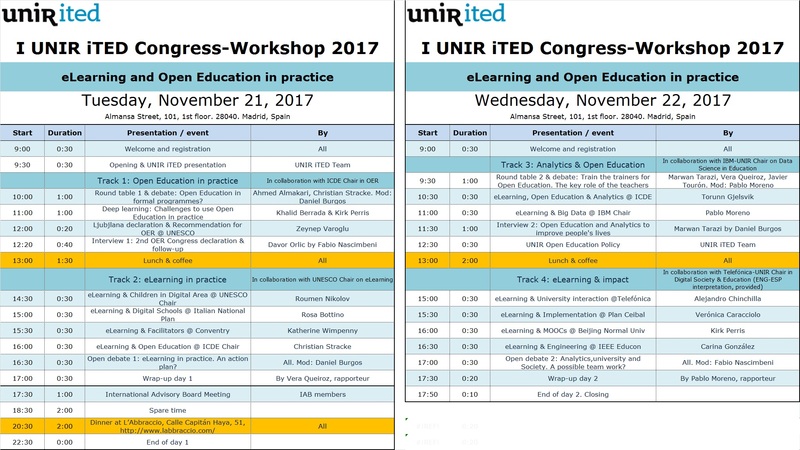 The first day of the Congress-Workshop was focused on Open Education and was sponsored by the UNIR International Council for Open and Distance Education (ICDE) Chair on Open Educational Resources that has worked very hard in order to help stablishing a common agenda about open, flexible and online education. The congress took place one month after the XXVI ICDE Worl Conference 2017 and two months after the 2nd World Open Educational Resources Congress in Ljubljana, where was adopted de Ljubljana OER Action Plan. 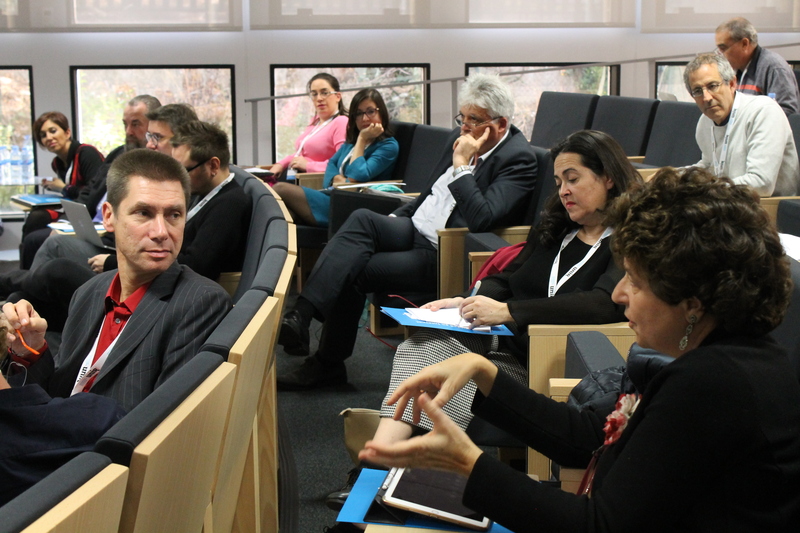 Round table 1 & debate: Open Education in formal programmes? Ahmed Almakari (IBN ZOHR, Morocco) and Christian M. Stracke (Open University of the Netherlands, The Netherlands), mod. by Daniel Burgos (Universidad Internacional de La Rioja, Spain). Deep learning: challenges to use Open Education in practice. Khalid Berrada (Cadi Ayyad University, Marrakech) and Kirk Perris (Ipsos & Commonwealth of Learning, Canada; Beijing Normal University, China). Ljubljana declaration and recommendation for OER. Zeynep Varoglu (UNESCO, France). Interview. 2nd OER Congress declaration and follow up. Davor Orlic (Knowledge 4 All Foundation, United Kingdom) by Fabio Nascimbeni (Universidad Internacional de La Rioja, Spain). In the second part of the day, prepared with the collaboration of the UNIR UNESCO Chair on eLearning, representatives of institutions from different countries could give the assistants their vision about children in digital area, digital schools or the role of facilitators. The day ended up with an open debate with the main question: is there an action plan? eLearning and children in digital area. Roumen Nikolov (UNESCO Chair, ULSIT, Bulgaria). eLearning and digital schools. Rosa Bottino (Italian National Research Council Institute for Educational Technologies, Italy). eLearning and facilitators. Katherine Wimpenny (Coventry University, United Kingdom). eLearning and Open Education. Christian M. Stracke (Open University of the Netherlands, The Netherlands). Open debate 1: eLearning in practice. An action plan? All, mod. by Daniel Burgos. On November 22nd, we could count on Pablo Moreno, head of IBM-UNIR Chair on Data Science in Education. During the morning the assistants could participate in the interesting roundtable discussion about the teacher role and how to train the trainers in new competencies and skills. Round table 2 & debate. Train the trainers for Open Education. The key role of the teachers. Marwan Tarazi (Birzeit University, Palestine), Vera Queiroz (EP- Universidade de Sao Paulo, Brazil), Javier Tourón (Universidad Internacional de La Rioja, Spain), mod. Pablo Moreno (Universidad Internacional de La Rioja, Spain). eLearning, Open Education and Analytics. Torunn Gjelsvik (International Council for Open and Distance Education – ICDE, Norway). 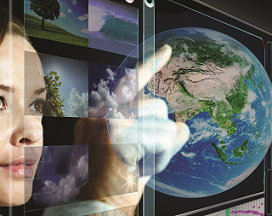 eLearning and Big Data. Pablo Moreno (Universidad Internacional de La Rioja, Spain). Interview 2: Open Education and Analytics to improve people’s lives. Marwan Tarazi (Birzeit University, Palestine) by Daniel Burgos (Universidad Internacional de La Rioja, Spain). UNIR Open Education Policy. Daniel Burgos (Universidad Internacional de La Rioja, Spain). As Daniel Burgos said, UNIR is the first private university and the first spanish university with an Open Education Policy, that outlines the vision of UNIR towards Open Education. UNIR wants to encourage staff and students to use, create and publish Open Educational Resources and services to enhance the quality of the student experience, enhance the provision of learning opportunities for all, and improve teaching practices. In the afternoon, after a goodbye lunch with all the assistants, we could assist to different panels about eLearning and university interaction, eLearning and its implementation or MOOCS. eLearning and implementation. Verónica Caracciolo (Plan Ceibal, Uruguay). eLearning and MOOCs. Kirk Perris (Ipsos & Commonwealth of Learning, Canada; Beijing Normal University, China). eLearning and engineering. Carina González (Universidad Internacional de La Rioja, Spain). Open debate 2: Analytics, university and society. A possible team work? All, mod. by Fabio Nascimbeni (Universidad Internacional de La Rioja, Spain). 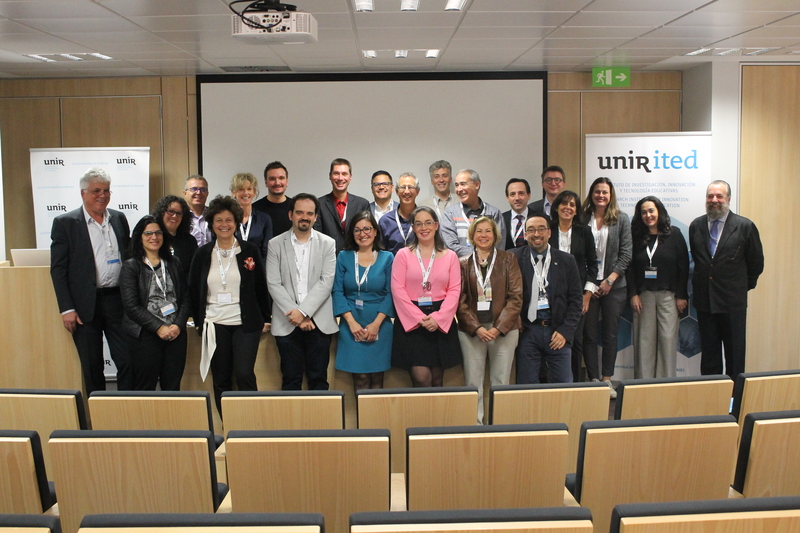 UNIR iTED Congress-Workshop couldn’t have been possible withouth the collaboration of all the experts. Thank you all for coming and sharing with us.